The War Memorial, located in Downtown Syracuse. Around the country, hometown fans seem to fall in love with their team’s old arena. Los Angeles fans love Dodger Stadium. People in Boston love Fenway Park. And basketball fans in Philadelphia love the experience of the old Palestra. But here in Syracuse, the old arena downtown has fallen out of favor. 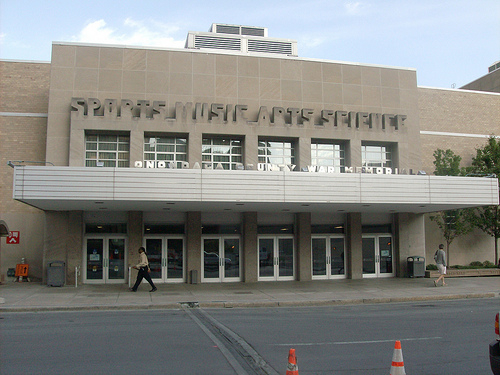 The War Memorial Arena, once the center for downtown entertainment, has become an afterthought. The main problem: the multiple needs for the arena means the price for repairing the building continues to climb. The auditorium of the arena needs to be painted, and that costs one hundred thousand dollars. The glass and dasher system for hockey games is a one hundred and fifty thousand dollar repair. The zamboni machines for the ice are 16 years old and cost ninety thousand a piece. The new video scoreboard will cost over seven hundred and fifty thousand dollars. These projects and the list of others total a budget sheet that reads over twelve million dollars. Toennies and are her staff have a five year plan to try and turn the place around and fill it with new and exciting events, but they also understand that it is going to take a lot of hard work to get that plan rolling. County funding is very difficult to come by as it took months to strike a deal for the scoreboard. So the OnCenter and the Syracuse Crunch, the main users of the arena, need to find other ways to raise funds. Danielle Goss, the Director of Operations at the War Memorial, while hoping for the legislators to provide chunks of funds, realizes other plans like adding a dollar to each ticket is a more realistic fundraiser. And the Crunch, while they understand that the arena is old and in desperate need of repair, want to stay in Syracuse. Last year they signed a ten-year lease to stay and play at the War Memorial that will keep the team in town until at least the end of the 2018-2019 season. The Vice President of the Crunch Jim Sarosy said it was very important for the Crunch to stay in Syracuse because of the incredible support the team receives. He said the team is working with the OnCenter to improve the fan experience while at the War Memorial.